So I might have used this recipe as an excuse to use these cute little individual casserole dishes from Le Creuset. There’s something welcoming and comforting about having your own personal casserole, lid included. What’s layered underneath the two peeping egg yolk eyes? Alternating layers of mozzarella cheese and potato lightly seasoned with with dried herbs and fresh parsley. Let’s face it: between the melted strings of mozzarella and the brilliant yellow runny yolk flowing over slices of baked potato, gooyeness has undoubtedly taken over this brunch dish. Preheat oven to 350 degrees. Grease 3-6 ramekins (6 small ramekins or 3 large ones). Place a layer of potato at the bottom of each ramekin. Cover with slices of mozzarella. Sprinkle with salt, pepper, 1/4 teaspoon each dried tarragon and oregano, parmesan cheese, and parsley. Add another layer of potatoes and repeat seasoning. Add a layer of mozzarella slices. Brush the top of each ramekin with melted butter. Bake about 30 minutes. 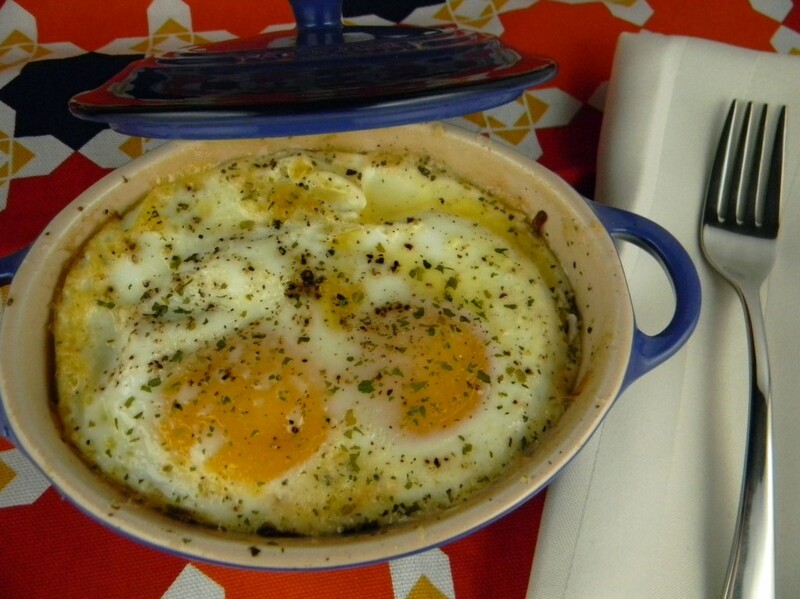 Break eggs on top (one egg for small ramekins, 2 eggs for large). Sprinkle with remaining butter, herbs, salt, and pepper. Return to oven and bake about 20 minutes or until eggs are set. Serves 3-6 (depending on the size of ramekins used).